Ok, I know what you’re going to say- “But Sadie, you’ve already repurposed a gun rack before!”. And you’re right, I have…but what can I say? Another wall gun rack crossed my path and I couldn’t resist! It was dusty and cheap, and all I could think was that it would be PERFECT as a wall mounted coat rack or coat tree for entryway storage. True story- I’ve had this wall gun rack in the garage for a very long time. And the reason I’m finally repurposing it? I kept knocking into it and eventually stepped on two of the “hooks” and I was worried I would destroy the whole thing if I didn’t DO SOMETHING with it. So it was finally time to transform it into the wall mounted coat rack / coat tree idea I had in my head. This post contains affiliate links for your crafting convenience. Anyway- I could have left my wall gun rack just as it was…but I had to tweak it ever so slightly first. I wanted to maximize its gear-holding potential by adding another row of hooks. So, first, I dug out a piece of scrap plywood from our garage. Then, we simply measured out a narrow piece that would fit across the back of the wall gun rack, sawed it out, and sanded it down. Now it’s ready for a makeover. Of course, I couldn’t leave my wall gun rack turned coat tree alone…especially with the original dark wood of the gun rack and the blazingly pale new plywood! I didn’t have the patience to brush paint it, so I tried a new color of spray paint to bring my wall mounted coat rack all together! I distressed it along the edges, as well, before sealing it with clear wax. Doesn’t it look gorgeous? I’m kind of in love with this new paint! A close up…love how it looks! Now all I needed to do was add some more hooks and my wall mounted coat rack would be complete! Since I couldn’t easily replicate the same shape as the holders on the wall gun rack, I salvaged some old brass coat hooks off a broken thrift store find. All I need are the hooks! Aren’t those great? We carefully removed them from the broken shelf and spaced them out evenly on the new plywood strip. Now my coat tree or wall mounted coat rack has even more entryway storage options. After adding a pair of D-ring hangers to the back of the rack, we hung our new coat tree or wall mounted coat rack! 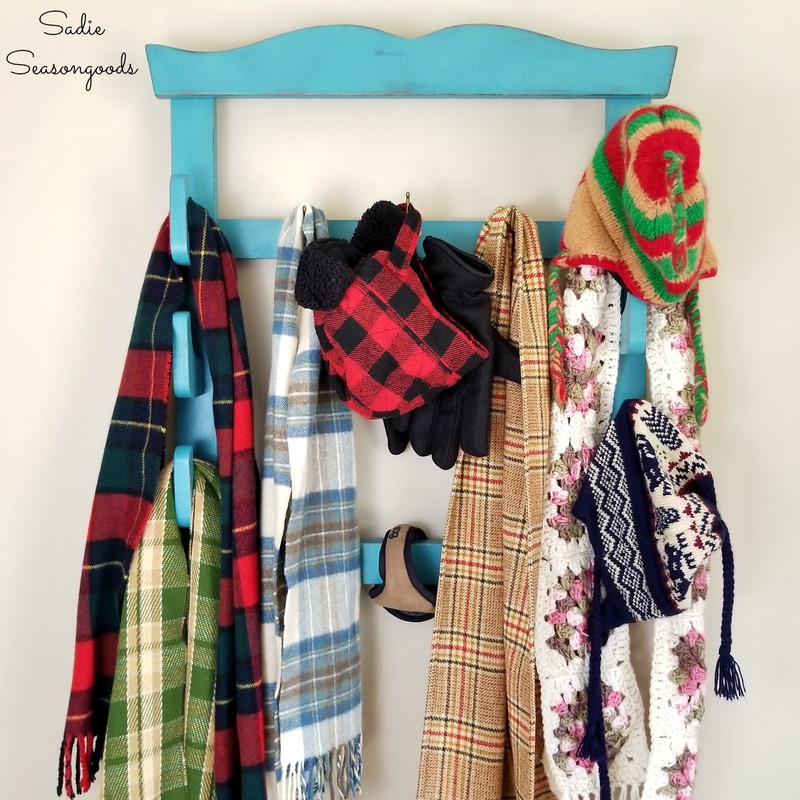 Now that upcycled vintage wall gun rack is perfect for all of our winter gear- especially scarves and hats which can easily get out of hand. Entryway storage has never been easier with this repurposing idea! Ta-da!! Ready (and organized) for winter weather. I do wish we had a mudroom or other space in our home where this entryway storage project would be decorative as well as functional. Next time you see a wall gun rack at the thrift store, don’t pass it up! 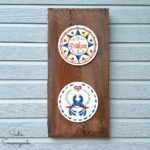 It’s an excellent piece to upcycle into a coat tree or wall mounted coat rack. And if you’re interested in more repurposing organization projects, check out my full collection here! Another great upcycle! Love the color you chose too! Well, I’ve already got gun racks on my look-for list; I’m gonna do mine with dowels to hold ribbons like your scrap fabric one. I LOVE the shape of the top of yours, and that color, too. This project is great, as usual; functional and space saving; it could even fit on the back of a door! In a dark royal blue, wouldn’t it be great in a teen-aged boy’s room? Oh, wait, the floor is easier! I think I would have Jon cut a new piece for the broken shelf and upcycle that with a coat of paint and black hooks! Doncha love making projects for the honey-do list? This is another sweet repurpose! Love the aqua color, and is a better use for the gun rack IMO. Pinned. Yes, yes, yes!! I love repurposing gun racks for anything BUT their original purpose- I’m a tender soul like that. 😉 Thank you, Florence!